Glaucoma is a condition that causes damage to your eye's optic nerve and gets worse over time. It's often associated with a buildup of pressure inside the eye. The increased eye pressure, called raised intraocular pressure, can damage the optic nerve, which transmits images to the brain. 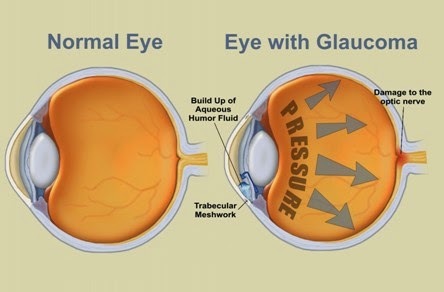 If damage to the optic nerve from high eye pressure continues, glaucoma will cause permanent loss of vision. Without treatment, glaucoma can cause total permanent blindness within a few years. Because most people with glaucoma have no early symptoms or pain from this increased eye pressure, it is important to see your eye doctor regularly so that glaucoma can be diagnosed and treated before long-term visual loss occurs. Glaucoma tends to be inherited and may not show up until later in life. If you are over age 40 and have a family history of glaucoma, you should have a complete eye exam with an eye doctor every one to two years. If you have health problems such as diabetes or a family history of glaucoma or are at risk for other eye diseases, you may need to visit your eye doctor more frequently. Open-angle glaucoma: Also called wide-angle glaucoma, this is the most common type of glaucoma. The structures of the eye appear normal, but fluid in the eye does not flow properly through the drain of the eye, called the trabecular meshwork. Angle-closure glaucoma: Also called acute or chronic angle-closure or narrow-angle glaucoma, this type of glaucoma is less common in the West than in Asia. Poor drainage is caused because the angle between the iris and the cornea is too narrow and is physically blocked by the iris. This condition leads to a sudden buildup of pressure in the eye. For most people, there are usually few or no symptoms of glaucoma. The first sign of glaucoma is often the loss of peripheral or side vision, which can go unnoticed until late in the disease. This is why glaucoma is often called the "sneak thief of vision." Detecting glaucoma early is one reason you should have a complete exam with an eye specialist every one to two years. Occasionally, intraocular pressure can rise to severe levels. In these cases, sudden eye pain, headache, blurred vision, or the appearance of halos around lights may occur. Untreated glaucoma can lead to blindness. Eye drops or tablets may be prescribed to reduce fluid production and consequently reduce pressure in the eye. Laser or surgical treatment may be used when medical treatment isn't sufficiently effective. People over the age of 40 are advised to have their eyes tested every two years to check for signs of glaucoma. If glaucoma is identified early enough, treatment can be given to prevent further damage and reduce the risk of blindness. These tests are available at your local optician and should include: examination of the optic disc measurement of the pressure in the eye checking of peripheral vision (by looking for a sequence of spots of light on a screen).